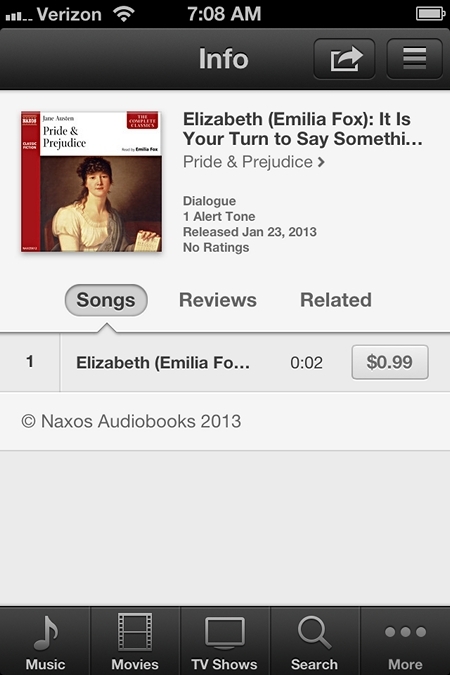 Last month I reviewed the Naxos Audiobooks edition of Pride and Prejudice, read by Emilia Fox. It is my favorite audio edition of Jane Austen’s classic novel. I was thrilled to learn that they have also created in honor of this year’s bicentenary of publication a clever alert tone for iPhone, iPad or iPod Touch of a select section of the recording. Wouldn’t it be totally cool and so chic to have actress Emilia Fox as Elizabeth Bennet saying, “It is your turn to say something now, Mr. Darcy.” when you receive a new email or text message on your electronic device? Well, now you can. It is only accessible within the iTunes store on your iOS device. Once it is downloaded, you can set your new tone as your default tone or assign it to a Contact. Why not try it? Gentle readers, please bear with this Luddite who does not own a cell phone, iPod or iPad. If I make a mistake in the description or process to purchase, please forgive me. My computer and NOOK are as a techie as I get. You cannot purchase ringtones and alert tones from your computer, but you can purchase them using your iOS device with iOS 5 or later. You can purchase tones on iPad, iPhone (3GS or later), and iPod touch (4th generation or later). Tap Tones. If Tones is not visible, tap More > Tones. Browse for tones. Once you purchase a tone, a dialog is displayed. The dialog gives you an option to set your new tone as your default tone or assign it to a Contact. If you don’t want to do anything with the tone just yet, simply tap Done. Tones purchased using your iOS devices are synced to your iTunes library when you connect your device to your computer. On an iPod touch or iPhone, you can find tones in Settings > Sounds. On an iPad, you can find tones in Settings > General > Sounds. Naxos Audiobooks has generously offered 6 alert tones of Elizabeth Bennet saying, “It’s your turn to say something now, Mr. Darcy.” available to Austenprose readers. You must have iOS device. Just leave a comment stating what quote from P&P you would like them to create next! It must be one sentence. The contest ends at 11:59 pm on Wednesday, February 13, 2013. Winners will be announced on Thursday, February 14, 2013. They will receive an iTunes card to purchase their new Pride and Prejudice alert tone. Good luck! My favorite quote is not really good ringtone material. But I love it so. I use if for all manner of things….like when my cat knocked over the Christmas Tree. “Really, Mr. Collins, you puzzle me exceedingly!” I don’t know why I said that to the poor cat. His name isn’t Mr. Collins, it’s Mr. Wickham…. I ardently love and admire you! I don’t have an ‘IOS,’ whatever that thing is (my ignorance is telling on me) and as I have had continuing difficulty in listening to audio books (I’m near deaf or so my wife says) and lastly I’m so intensely visual that I very much prefer reading the word. I’ll say one thing about NAXOS though…..The quality of their CD’s, especially in classical or fine music, is unparalleled so I can only imagine the quality of this audio book! Maybe a few Lady Cat quotes, like “Obstinate, headstrong girl!” or if it the sound was to notify about a new message, “I will not be interrupted.” But there are the classics less used, “Keep your breath to cool your porridge,” & “Those who do not complain are never pittied” or one of my favorites “It is very often nothing but our own vanity that deceives us.” Ooh, just too many to wonderful ones in the book to choose only one. –and all the other quotes already mentioned above… really, no quote from P&P would be bad! Thanks for arranging this. I hate to be too much of a traditionalist, but I love “It is a truth universally acknowledged that a single man in possession of a great fortune must be in want of a wife.” Is that too long for a tone? Well, I like it anyway. I think it’s witty and sets the tone, if you will, for what is to come. I agree with Laurie completely. You’re having a tough day and then that ringtone calls out to you. You would at the very least smile! My favorite is “We are all fools in love”. “I am the happiest creature in the world.” Short and sweet! However, hearing the “ardently” quote as a ring tone would be lovely, too! So many great ideas! I think it would be funny to have a few of the different indignant “Mr. Darcy!” that are uttered throughout the book. I am too new to PandP to know any quotes! But all the quotes posted here sound lovely! And I have this audio version of the book (thanks Laurel Ann!) and just actually started listening to it this week. Emilia Fox is great!